Dual Pallet Separators are uniquely designed to work in tandem in deep-lane and extra-deep lane pallet flow systems (lanes up to and over 20 pallets deep). Dual pallet separators increase the safety and effectiveness of deep-lane pallet flow by reducing the back pressure inherent in the sloped system design. Back Pressure is the force exerted from the weight of the rear pallets onto the front pallet. The pallet separators are installed in strategic positions along the lane to stop pallets and hold them in place until the front pallet is safely picked. Once the front pallet position is clear, the separators again are automatically triggered to release the rear pallets and advance down the lane. When in position, the pallet separators hold and lock rear pallets back about 6″- 12″ from the front position pallet. When designing the pallet flow lane, you must account for back pressure which is significant for lower level picking applications but even more critical at higher elevations where the forklift mast capacity is reduced. 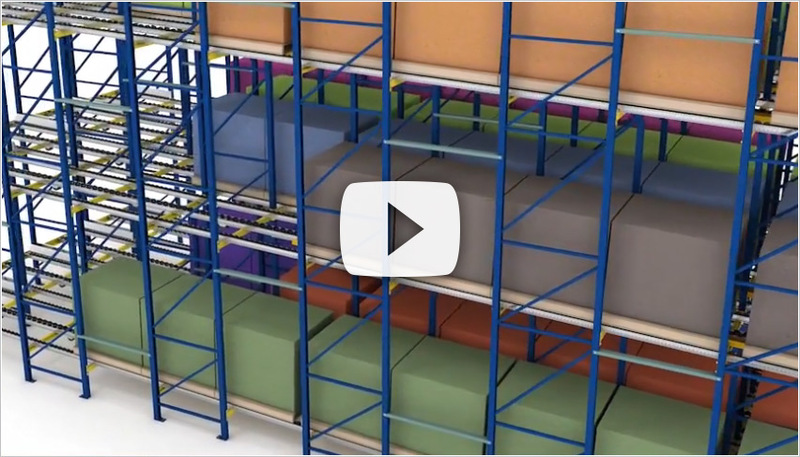 Take a look at a recent product testing video – The test lane is 6 pallets deep with dual separators located after the first and fourth pallet positions. As the front pallet is lifted by the forklift, the front separator triggers the release of the next 3 pallets. As these pallets come to rest, the rear separator is then triggered to release the remaining pallets; maintaining separation between pallet 1 and 2 and pallets 4 and 5, reduces excessive back pressure from these rear positions. Download our pallet separator brochure to learn more about dual pallet separators and to see the whole line of customized pallet flow lane separators available from Mallard. Contact us for specs for outfitting new or retrofitting existing pallet flow lanes.